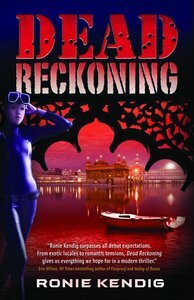 Dead Reckoning is the story of a young woman anxious to abandon the crushing effects of her father "s espionage career only to find herself tangled in the very web of mystery and intrigue that consumed his life. Underwater archeologist Shiloh Blake is consumed with passion for the water and inflamed at the injustices of life, blaming her secret agent father for her mother's death. When her first large-scale dig traps her in the middle of an international nuclear arms clash, she flees for her life and is followed by an unknown man. Who is he? How is he always one step ahead? Reece Jaxon is a former Navy SEAL, who now serves his country as a spy. His mission is threatened by the beguiling Shiloh Blake as he hunts down the sources to a nuclear dead drop in the Arabian Sea. The only way to end this nightmare and prevent a nuclear meltdown is for Shiloh to join forces with Reece. Will Shiloh violate her vow to never become a spy like her father? Will she reconcile with her father? Will her trust issues destroy her chance for love? And will she allow God to help her through this ordeal? When underwater archaeologist Shiloh Blake finds herself in the middle of an international nuclear arms clash during her first large-scale dig, she flees for her life. Is the man trailing her an enemy or a protector sent by her CIA father? Whoever he is, the only way to prevent a nuclear meltdown means joining forces with this mystery man. Will Shiloh violate her vow to never become involved in her father's web of intrigue and mystery? Will she reconcile with her past and with him? Will she allow God to help her through this ordeal of danger, mistrust, and uncertainty? Customer Reviews For "Dead Reckoning"
Thoroughly enjoyed this novel- a great plot with realistic action sequences that kept me on the edge of my seat. I could not put this book down. It is tightly written with convincing dialogue that does not sound contrived or 'fake'. There were some incidents in the story that I didn't think were wrapped up by the end of the story, however, these were minor plot details that in no way detracted from the overall story. Looking forward to many more books from Ronie Kendig.